This private cooking class in Cascais is a fabulous gourmet experience for guests looking for a luxurious and imaginative excursion from Lisbon. Learn all about Portuguese cuisine, characterized by its use of fresh ingredients such as fish, shellfish and vegetables; its world-class olive oils, cheeses and cured hams; and its tantalizing desserts (the Portuguese have a major sweet tooth!). Some star products include Queijo de Serpa (from the beautiful Alentejo region) and Pico (from the Azores Islands); Pão de Milho (traditional cornbread); olive oils from the Esporão and Quinta das Marvalhas estates; “Ameixas de Elvas” (Elvas plums); “Piri- Piri” sauce (spicy sauce imported from Angola); “Salpicão” smoked sausages; and the ubiquitous “Bacalhau” (salt cod, a Portuguese delicacy). With your own private chef you will prepare a three-course traditional but elegant meal, that might include dishes like Ameijoas à Bulhão Pato (steamed clams with garlic, cilantro and white wine) followed by a fish stew (“Caldeirada) or the famous “Bacalhau” (salted codfish) prepared in an infinite number of ways and culminating in a deliciously naughty dessert-like “Barrigas de Freira” (colorfully translated as nuns’ bellies). After your morning of cooking, you will sit down and taste your dishes, along with excellent Portuguese wines. Then after lunch you will meet your local guide for a fascinating walking tour of Cascais old town, ending in the renowned Palacio Hotel in Estoril for an aperitif, perhaps you will go for a Martini “Shaken, not stirred” before returning to Lisbon, where your chauffeur will transfer you to your hotel or next port of call. Contact us for more information on this gourmet experience. 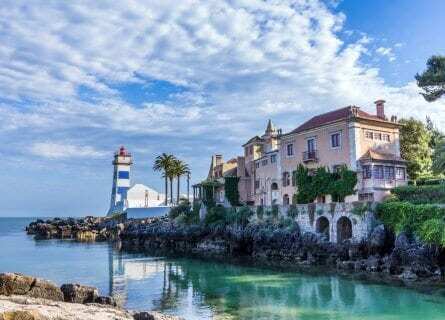 This morning your private chauffeur will pick you up from your hotel in Lisbon and you will drive along the Atlantic coast to the aristocratic seaside town of Cascais. Cascais has long attracted nobility and wealthy foreigners and many beautiful villas were built along the sea in the 1800’s. You will meet your chef and host for the morning at the Cascais market, where he will advise you on the selection of your ingredients, then your chauffeur will transfer you and your delicious purchases to the Marina, where your class will begin. Your cooking class will have a partial demonstration and be hands-on and will include a three-course menu, as well as other nibbles and wines. While you cook, enjoy the views over the marina, and after a fantastic morning learning all about Portugal’s gastronomic heritage, you will sit down to enjoy the meal you have helped prepare, served with superb Portuguese wines of course. After lunch, your friendly and extremely knowledgeable guide will meet you for a guided walking tour of Cascais. Discover how the arrival of the Portuguese Royal family changed what was once a sleepy fishing village into a plush holiday retreat for the nobles. Stroll around the residential area, listening to many anecdotes en route. You will visit the Paula Rego Art Gallery, Cultural Center and the Castro Guimarães House & Museum before heading along the promenade to Estoril and the distinguished Palacio Hotel. Have a peek at the Royal Portrait Gallery before taking a seat in the elegant bar for an aperitif, maybe you’ll sit where Fleming sat while writing Casino Royale. In the late afternoon, your driver will take you back into Lisbon, dropping you off at your hotel. And this concludes your memorable gourmet experience today. We hope you had a magnificent time! Sounds silly or surprising but from a dining perspective, this was one of the best full course meals I personally have ever had and without question the best food combination in Portugal. Miguel Oliveira who did the instruction and cooking was outstanding. I would do a cooking class without question again as he has now set a high value for others to be judged by. We plan on trying to duplicate his recipes. The food was so good we would have gone back to his restaurant on a different night. It was great.